LEGAL NOTICE AND INFORMATION RELATING TO LAW 34/2002, OF JULY 11, SPANISH INFORMATION SOCIETY AND ELECTRONIC COMMERCE SERVICES LAW. 1. Data of the information society services provider. · Its corporate name is "BCO Bookings S.L." · It has Tax I.D. Code (CIF) B-54916945. · It is entered at Alicante Commercial Registry on Volume 3.931; Page A-149159 and Folio 1. · You may get in touch with us at e-mail address info@booking-centre-online.com. The information relating to the products and services offered in the pages of this web site is contained in the page in which the product or service in question is offered. The conditions of this Legal Notice regulate the permitted legal use of this web page. By merely visiting this web page you become a user. The use of the web page and of any of its services implies your acceptance as user, without qualifications, of each and every one of the conditions of this Legal Notice published by BCO BOOKINGS S.L. from time to time, and of the Particular Conditions that, as the case may be, regulate the use of the web page or of the services offered through it. Users may access www.booking-centre-online.com free of charge, nevertheless, certain services and contents offered by BCO BOOKINGS S.L. or third parties through www.booking-centre-online.com may be subject to the prior contracting of the service or product and to payment of an amount of money as established in the respective conditions of this Legal Notice and of the Particular Conditions that, as may be the case, regulate the website or the services offered through it, in which case they will be made available to you clearly. 4. Use of the web site. · Use contravening the laws of Spain or infringing rights of third parties. · Publication or transfer of any violent, obscene, abusive, illegal, racial, xenophobic or slanderous contents. · Reproduction or copy, distribution, permitting of access of the public through any form of public communication, transformation or modification of the contents, unless authorization is obtained from the holder of the respective rights or this is permitted by law. · Cancellation, avoidance or manipulation of the copyright and other identity data of the rights of the holders included in the contents, and the technical protection devices, or any information device that the contents may include. · Alteration or participation through fraudulent means of personal web pages or e-mails or systems of other users or third parties without their authorization. · Cracks, program series numbers or any other contents that violate intellectual property rights of third parties. · Collection and/or use of personal data of other users without their express consent or contravening Basic Law 15/1999, of December 13, Personal Data Protection Law. · Use of the contents and, particularly, of any information obtained through the web page or the services to send advertising, notices for direct sales or for any other purpose, unrequested messages to a number of persons regardless of their purpose and marketing or dissemination of such information in any manner. ·The use of the domain name e-mail server and of the e-mail addresses for spam, mail bombing, phishing, escrow fraud, scam 419, pharming, dissemination of viruses (Trojans, worms, etc. ), or any other kind of activity performed in sabotage or fraudulent or criminal intent. BCO BOOKINGS S.L. is not obliged to control the use of the Services by the users. Particularly, BCO BOOKINGS S.L. does not warrant that the users use the Service on the conditions of this Legal Notice or that they do so in a diligent manner. Neither is BCO BOOKINGS S.L. obliged to verify the identity of the users, or the veracity, validity, exhaustiveness and/or authenticity of the data made available by the users referring to themselves or to other users. However, BCO BOOKINGS S.L. keeps the data and information required from it by legislation in force. BCO BOOKINGS S.L. provides e-mail address info@booking-centre-online.com to the users to identify and correct errors in the introduction of data. The user accepts to maintain in operation, active and updated the e-mail address provided in the contracting form for notices to www.booking-centre-online.com, since this is the preferential means of communication with www.booking-centre-online.com. It is prohibited to access, modify or view the setting, structure and files of the servers of www.booking-centre-online.com. The user will be held liable at civil and criminal law as appropriate for any problem that may arise in the servers and security systems of BCO BOOKINGS S.L. due directly to his negligent action. The user must respect the technical standards imposed by BCO BOOKINGS S.L. in the management and development of the contracted products to avoid any abusive use that may slow down the servers to the detriment of the supply of the products or rights of other members or users. BCO BOOKINGS S.L. is the proprietor or, as appropriate, has the right of use and operation over, the texts, images, logos, distinctive signs, sounds, animations, videos, source codes and other contents included in this website which are to such effect works protected by intellectual and industrial property legislation in force. Any transfer, distribution, reproduction or storage, in whole or in part, of the contents stored in this web site is expressly prohibited without obtaining prior express consent from the proprietor. Notwithstanding the above, users may reproduce or store the contents of the website for their exclusive use but the reproduction of items or contents of this website for profit-making or commercial purposes is expressly and strictly prohibited. BCO BOOKINGS S.L. retains the authority to make, at any time and without need for prior notice, modifications and updates to the information contained in the website and its setting and presentation. The user should therefore access updated versions of the page. The company controller of the website does not warrant the inexistence of interruptions or errors in the access to the page of its contents, or that it is up to date or free from viruses or from any other item that may alter is computer system. BCO BOOKINGS S.L. disclaims any contractual or non-contractual liability to any individual or corporation who may use it and sustain any damages caused by computer viruses or computer elements of any kind. The website owner will not be liable for any consequence, damage or harm that may be caused by the unconsented use of the information contained in the website or by the services, opinions and advice included in our website. 5. Liability disclaimer of BCO BOOKINGS S.L. BCO BOOKINGS S.L. disclaims any liability for the contents of the web pages that the users may access through the website of BCO BOOKINGS S.L. BCO BOOKINGS S.L. disclaims any liability for any loss and damages caused or that may be caused by the use of the information, of the matters contained in this website or of the programs it includes. BCO BOOKINGS S.L. disclaims any liability for any contents published by users using the services described herein and particularly for the use by its users of the e-mail contravening the law, ethics or public policy, infringing intellectual or industrial rights or containing any defect, deficiency, computer virus or similar software routine. The website www.booking-centre-online.com may contain links to other pages of third parties that www.booking-centre-online.com is unable to control. Accordingly,www.booking-centre-online.com is unable to assume any responsibility for the contents that may appear in pages of third parties. The user admits that problems and/or failures may exist in respect of the communications with the website and accepts that BCO BOOKINGS S.L. does not furnish any warranty relating to the use, reliability, results of update of the website. BCO BOOKINGS S.L. does not have complete control over the Internet and, accordingly, the service may be interrupted for reasons beyond the control of BCO BOOKINGS S.L. At certain times, some of the services offered by BCO BOOKINGS S.L. may be interrupted due to maintenance work, repairs, etc. In such cases, BCO BOOKINGS S.L. will ensure that the scheduled time periods for such work are respected. · Lack of availability and continuity in the operation, utility and reliability of the Services and of the website. · Alteration of the privacy and security in the use and contents of the website and of the services by third parties to them pursuant to the legal system in force. · The presence of viruses or of other false elements in the services offered by third parties through the website that may cause alterations in the computer system, electronic documents or records of the users. BCO BOOKINGS S.L. disclaims any liability for viruses originating from an electronic transmission incorporated by third parties (for example, word processor macros, Java applets and ActiveX programs), generated to obtain adverse results for a computer system. · The use of the Services, of the website and of the contents by the users. · The information, contents and services hosted outside, even if accessible from, the website. · Lack of availability and continuity in the operation, utility and reliability of the Services and of the website of third parties cooperating with BCO BOOKINGS S.L. 6. Limitation to the use of the Services. BCO BOOKINGS S.L. retains the right to deny the use of the Servicesand to withdraw information, data and contents disseminated or made available by third parties through www.booking-centre-online.com at any time and without need for prior notice to those users who breach this Legal Notice and/or the General Conditions for the use of the service published in www.booking-centre-online.com. BCO BOOKINGS S.L. offers the contracts of its products, the contracting procedure and the information published in its website exclusively in the languages Spanish, english, german and dutch. A.- Selection of the service. The user must introduce the rental criteria in the online booking form. - A service that includes a class of vehicle available for the indicated period with the selected options (if any). C.- Acceptance of the offer. The user will be requested to accept the offer, expressly accepting the General Conditions of Use of the Service. D.- Driver Data. The user will be requested to identify himself as the driver, using his user name and I.D. data. If the user does not introduce his data in the form, he will be unable to use the services of this website, since these data are compulsory fields. The user undertakes to use diligently and keep secret the e-mail address to access the services offered in this website. Accordingly, the users will be responsible for the adequate keeping and confidentiality of any identifiers and/or passwords that may be supplied to them by BCO BOOKINGS S.L., and undertake not assign their use to third parties, either provisionally or permanently, and not to permit the access thereto of third parties. Only the user will be liable for the consequences of their use by third parties, their misuse or loss or for forgetting the user name or password. The user will be liable for the unlawful use of the services by any unauthorized third party who uses for such purposes a password due to its use without meeting the standards of diligence or its loss by the user. F.- Confirmation of BCO BOOKINGS S.L. After the service has been booked, BCO BOOKINGS S.L. will issue a confirmation including the booking number and details. The user may access and obtain a copy of the booking through the website, by introducing his user name and password. BCO BOOKINGS S.L.. undertakes not to carry out misleading advertising. For these purposes, formal or numerical errors that may exist in the contents of the various sections of the web page due to an incomplete or defective keeping and/or update of the information contained in such sections will not be deemed misleading information. BCO BOOKINGS S.L.. hereby undertakes to correct such errors as soon as it becomes aware of them. 9. Data protection and privacy. BCO BOOKINGS S.L., through its web site "www.booking-centre-online.com" requests from the renter certain personal data for subscription or registration with some of its services. The data supplied by the renter will be included in an automated personal data filing system controlled by BCO BOOKINGS S.L., which will be processed to provide the services requested by the renter. The renter authorizes BCO BOOKINGS S.L. to include the personal data he supplies in the respective files for their use and processing, both automated and otherwise, for the purposes managing and recording the transactions made between the parties. 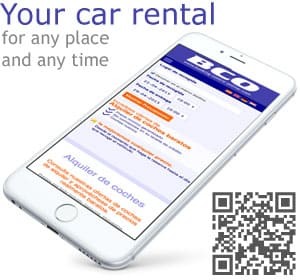 The renter, the first driver and the additional drivers authorize BCO BOOKINGS S.L. to include their personal data in our Database for their use and processing, both automated and otherwise, for the management and registration of the transactions made between the parties. They also authorize, independently from the contractual relationship, the processing of their personal data for the sending of commercial offers and advertising through any means (correspondence, telephone, fax, mailing or any other electronic procedure), of their own or of third parties, by BCO BOOKINGS S.L. The renter and the additional drivers authorize BCO BOOKINGS S.L.. to transfer their data to companies related directly or indirectly to BCO BOOKINGS S.L. for their personal data to be and to be able to send them advertising and commercial offers or their own or of third parties. The personal information obtained from the registered renters is stored in a database owned by BCO BOOKINGS S.L. which contains the technical, organizational and security measures that ensure the confidentiality and safety of the information in compliance with Basic Law 15/1999 of December 13, Personal Data Protection Law, and the Regulation implementing Basic Law 15/1999 (Royal Decree 1720/2007), and other applicable legislation. Additionally, BCO BOOKINGS S.L. informs you that, in the event of any default in payment for the rental services contracted by the renter, after a demand for payment made by BCO BOOKINGS S.L. the data relating to such non-payment may be disclosed to creditworthiness and equity data files, in compliance with data protection legislation in force. Should the renter or any of the drivers wish to access, rectify or cancel his data in any regard relating to Basic Law 15/1999, of December 13, Personal Data Protection Law, he may send a letter to such effect to BCO Bookings S.L., Avda del Pla 130, Office 1.01, Javea 03730 or by e-mail to info@booking-centre-online.com. Should your data be modified, please let us know for us to keep your data up to date. The headings of the various clauses are merely informative and will not have effects on or quality or extend the contents of this Legal Notice. In the event of inconsistency between the provisions of this Legal Notice and the General and/or Particular Conditions of each specific service, the Particular Conditions will prevail. Should any provision of this Legal Notice be deemed null or inapplicable in whole or in part by any Court, Tribunal or body with jurisdiction, this shall not have effects on the rest of the provisions of this Legal Notice or on the General and/or Particular Conditions of the various services of BCO BOOKINGS S.L. which will remain valid and enforceable. The failure by BCO BOOKINGS S.L. to enforce or exercise any right or provision of this Legal Notice shall not be deemed a waiver thereof, unless t otherwise acknowledges and agrees in writing. BCO BOOKINGS S.L. may amend, without prior notice, the information contained in its website, in addition to its setting and presentation. 11. Applicable legislation and jurisdiction. BCO BOOKINGS S.L. expressly declines to submit to the Transport Arbitral Panels or to any other arbitration proceeding. The Conditions of this Legal Notice are governed by the laws of Spain and the Spanish courts and tribunals shall have jurisdiction to hear any dispute relating thereto.